Plan a great party for your child. Do you know where you want to have the birthday party? Maybe you don't, but you know what kind of party activities you want. Perhaps you're entirely unsure. Take a look at your options below to find the best fit. I know where I want the party. 45 minutes designated for activity, 45 minutes designated for party celebration. Cost includes one party host, invitations, supervised activity and the party area in the lobby. Up to two additional participants for $12 each. One hour designated for two activities, one hour designated for party celebration. Cost includes two party hosts, invitations, supervised activities and the party area in the lobby. Up to four additional participants for $12 each. 90 minutes designated for two activities, 90 minutes designated for party celebration. Cost includes three party hosts, invitations, supervised activities and a private party area. Up to six additional participants for $12 each. Get started by filling out a rental application. Birthday parties are offered Saturdays and Sundays. For more information or to make a reservation, call the Birthday Party Hotline at (916) 774-5967. 1 hour for party celebration, use of pool during recreational swim hours. Cost includes one party host, lemonade, paper products and all amenities included in Recreation Swim. Guests are considered any adult or child attending the party, whether or not they are swimming. Additional guests are $4 per person. One hour of pool time, one hour for party celebration. Cost includes facility rental, lifeguards and inflatable obstacle course. Package does not include decorations, lemonade or paper products. Parties available on Saturdays and Sundays. Outside toys and flotation devices will not be permitted, with the exception of coastguard approved life jackets. Anyone wearing a life jacket must be accompanied by an adult in the water. Use of the inflatable obstacle course will be granted only to guests who are able to pass a swim test of 15 yards. To make a reservation, call the Birthday Party Hotline at (916) 774-5967 option 3. Cost includes three supervised activities. Add a 30 minute storytime for $50 or an historic site tour for $4 per person. Renters must provide one adult chaperone for every five children. Get started by filling out a rental application. For more information, call Maidu Museum & Historic Site at (916) 774-5934. Cost includes pre-built campfire, marshmallows, roasting sticks, access to the museum foyer and staff. Add a 30 minute storytime for $50. Get started by filling out a rental application. Additional party packages available at the adjacent facility, Maidu Activity Center. For more information about Maidu Museum & Historic Site rentals, call (916) 774-5934. The Roseville Aquatics Complex offers various party packages, June through August. 1 hour for party celebration, use of pool during recreational swim hours. Cost includes one party host, lemonade and paper products. Guests are considered any adult or child attending the party, regardless of whether or not they are swimming. Additional guests are $4 per person. One hour of pool time, one hour for party celebration. Cost includes private access to the play pool area, lifeguards and a party host. Package does not include invitations, decorations, lemonade or paper products. Guests are considered any adult or child attending the party, regardless of whether or not they are swimming. Parties available on Saturdays and Sundays. One hour of pool time, one hour for party celebration for up to 50 Guests. Guests are considered any adult or child attending the party, regardless of whether or not they are swimming.Cost includes private access to the recreation pool and water slide with lifeguards and a party host provided. Package does not include decorations, lemonade or paper products. Parties available on Saturdays and Sundays. To make a reservation, call the Birthday Party Hotline at (916) 774-5967 option 2. I know what activities I want. Campfire rentals are available at the Maidu Museum & Historic Site. For more information, locate the Maidu Museum & Historic Site section on this page. 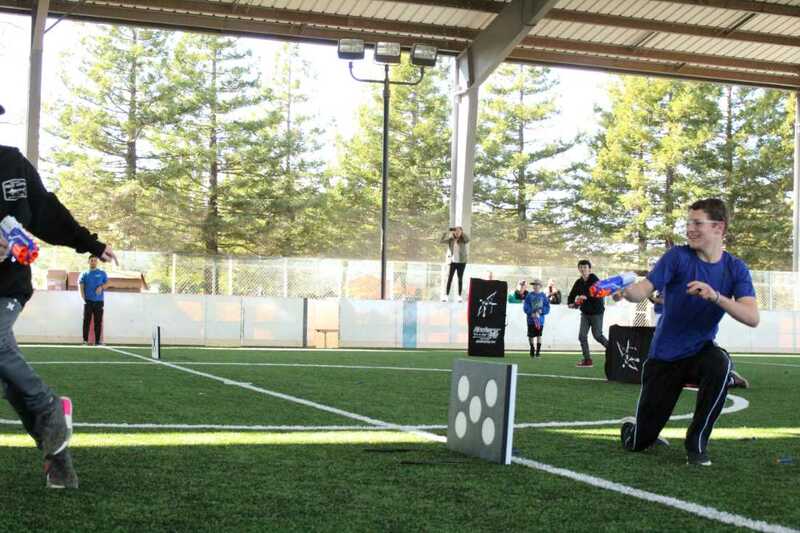 The covered arena and skate park at Maidu Regional Park offer a variety of birthday party themes on Saturdays and Sundays including: Archery Tag, Nerf Wars, Skateboarding and Tactical Dodgeball. Prices include 1.5 hours (one hour for designated activity and 1/2 hour for party celebration), two party hosts, supervised activities, covered arena (or skate park), and picnic table reservation. Maidu Activity Center and Maidu Museum & Historic Site offer various cultural and educational activities during their birthday party packages such as spear throwing, acorn grinding and campfires. For details on party packages, find Maidu Activity Center or Maidu Museum & Historic Site sections on this page. Roseville Sports Center offers basketball, football, volleyball and camp activities as birthday party packages. For more information, find the Roseville Sports Center section on this page. Mike Shellito Indoor Pool and Roseville Aquatics Complex offer birthday party packages. For more information, find their sections on this page.